Noah Layne (1979-) is a Canadian-American award winning realist artist based out of his studio in Victoria, BC, Canada. He has shown his work in shows and galleries across North America and been short listed for Canada’s National Portrait Competition “The Kingston Prize”, as well as being a Hudson River Fellow in New York. Noah has been painting and drawing since he was very young. Noah was born in St Andrews, New Brunswick to American and Dutch/Indonesian parents. He and his family traveled from there to Massachusetts, Kentucky, and Alberta before settling on the West Coast of Canada in Victoria BC when he was three years old. He was homeschooled as a child and encouraged and supported in pursuing his artistic passion. Layne started painting by copying Rembrandt and Winslow Homer paintings when he was 10 years old. 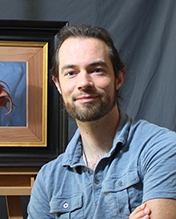 He went on to study various painting techniques and has been influenced by painters such as Bouguereau, Rembrandt, Sargent, and Wyeth. Noah works in oil and is an excellent draftsman. He believes in the importance of working from life. Noah is passionate about sharing his knowledge and has been teaching since 2008. He founded the Noah Layne Academy of Realist Art in 2014. • Has won two major awards at the Sidney Fine Art Show moving him into their master category. • Was short listed for Canada's National Portrait Competition “The Kingston Prize” 2009. • Was the cover and feature artist in Victoria’s Focus Magazine November 2005. • Was picked by Southwest Art Magazine in 2004 as one of 21 artists under 31 to collect now! Drawing and painting classes 2008- present. The Artist's Magazine 31th Annual Art Competition. 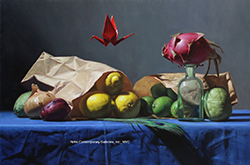 The Artist's Magazine 30th Annual Art Competition. The Artist's Magazine 29th Annual Art Competition. The Artist's Magazine 28th Annual Art Competition. The Artist's Magazine 27th Annual Art Competition. The Artist's Magazine 26th Annual Art Competition. Focus Magazine - "Noah Layne: The Beauty of Light and Line"
Kitsilano View - "Magic Realism"